Facebook advertising is advancing fast, and with over 2 million active Facebook advertisers, many brands simply can’t afford to ignore it. 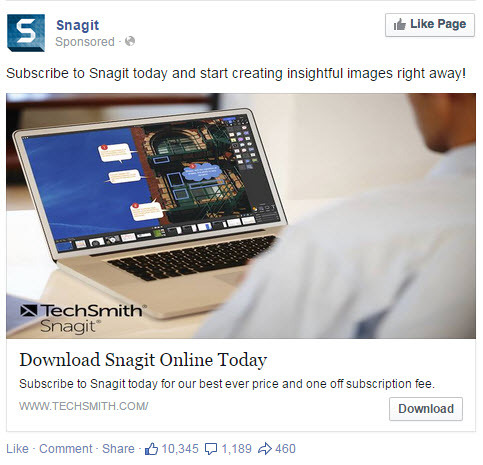 Facebook ads offer a unique proposition because of the sheer amount of data they have for you to use in your ad targeting, but in actual fact, one of the most powerful types of Facebook ad targeting is created by you, the advertiser. Facebook Custom Audiences are the crown jewel of Facebook ad targeting because using data that is unique to your brand, gives your campaigns real competitive advantage. In this post, I’ll share some strategies for using Custom Audiences and tips and tricks on how to implement them. Think about how much your usual email marketing costs, and how many members of your mailing list actually open your emails and click through to your landing pages. Imagine if you could only pay for the users who actually opened the email and clicked through to the landing page. 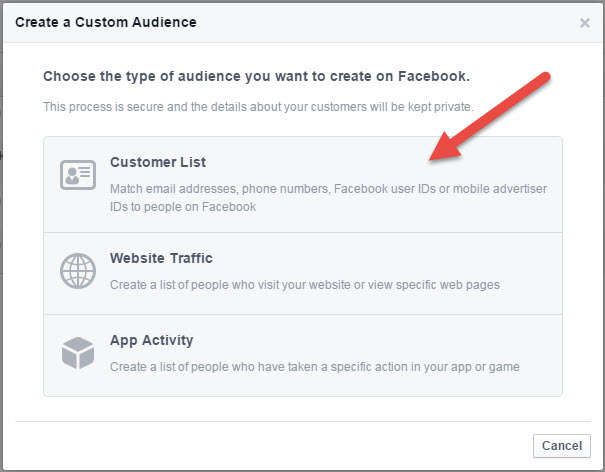 With Facebook Custom Audiences this is effectively what you can do! You can upload a list of email addresses and if they are associated with a Facebook account you’ll be able to target them with ads, but keep in mind that you need to have permission to use the email addresses for the purpose of advertising. Rest assured your data is in safe hands, as it is hashed locally on your system before it is uploaded to Facebook, so they never actually see the data and it is never used by them for any other purposes than your Custom Audience list. 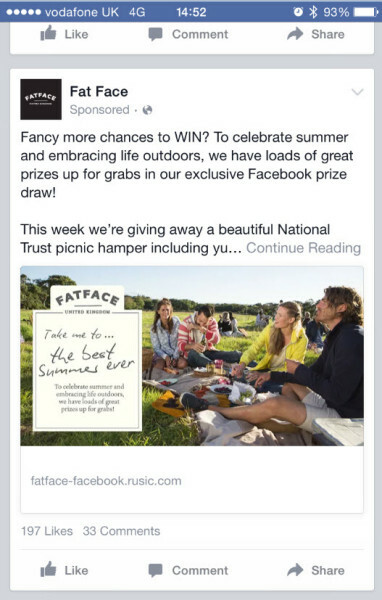 Remember that Facebook ads don’t need to work in a silo, and another great use for them is supporting your email marketing. 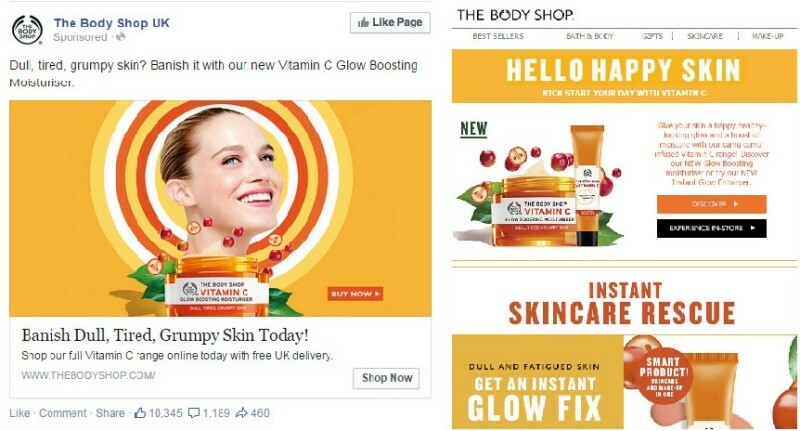 For example, when The Body Shop sent out an email about their Vitamin C range, they could have also show targeted the users on that mailing list with Facebook ads also promoting their vitamin C range. Another way to supplement your email marketing would be to upload a list of all the users who have not opened your emails and target them in their own campaign with ads containing the message you wanted to reach them within the email. This means that even if they didn’t open the email, they might still see your message in their news feed. For example, WeBuyAnyPhone could use an email list of people who have requested a posting pack, but who haven’t yet posted their phones to them. 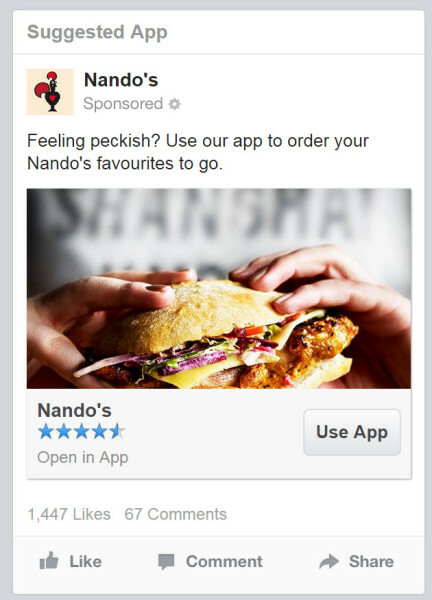 Showing Facebook website click ads to this audience would give them a gentle reminder to send their phones in, and the advertiser would only pay when the user clicks the ads rather than for impressions. If you have an email list of everyone who has trialled your product and a list of those actually subscribed, you can remove all the subscribers from your trial-ers list, and you will be left with a list of email addresses of all the users who trialled your product but haven’t yet purchased or signed up. 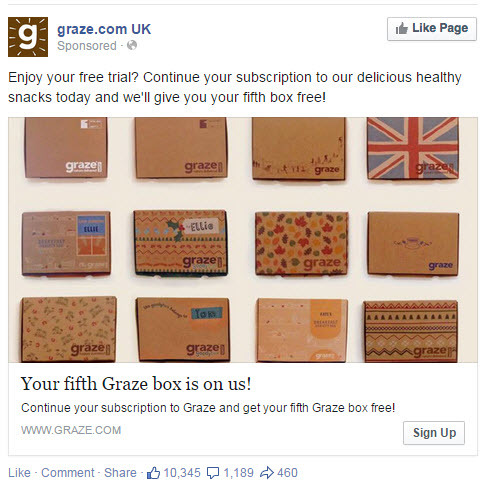 Graze is a really good example of how this could work in action because they use trialling as a key incentive to get new customers. Existing customers or mailing list members make the perfect audience to promote competitions as well because they’re already familiar with your brand, so the entry rate is usually much better than targeting an audience who could be new to your brand. 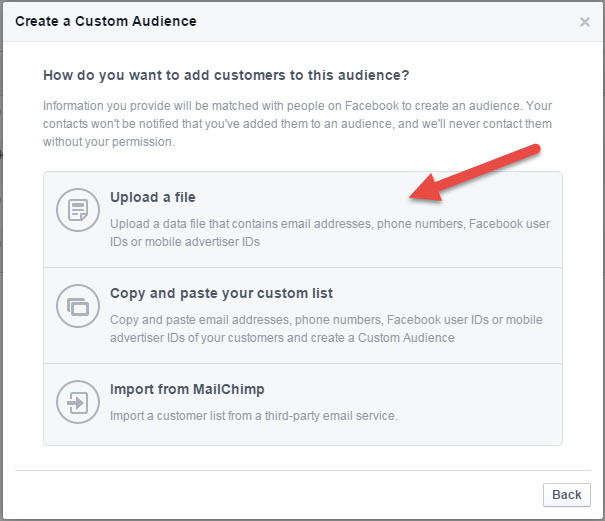 Using Facebook Custom Audiences you can upload a list of your existing customers or your mailing list of email addresses, and Facebook will match them to Facebook accounts where possible, allowing you to target them with ads promoting the competition. Choose emails as the data type, and then click upload file and choose your saved file, then click create an audience. Your document should be a CSV and have only a single column of data (the email addresses) and no column headings. It can take around 30 minutes to upload a file depending on its size. I’d recommend using as many email addresses as possible, because from experience only between 30% – 60% of those email addresses usually match up to Facebook accounts, so the more email addresses the larger your audience will be. If you have other data on your audience, such as their phone number, you could upload this and use it for targeting in the same way, even if you also have their email addresses used in another list. This is because some profiles might not have the email address associated with them, but might have the phone numbers. By using both methods of targeting you can ensure you have the maximum reach possible. To apply this new audience to an ad set, create your ad set as normal and then choose Custom Audience as the type of targeting you’d like to use. 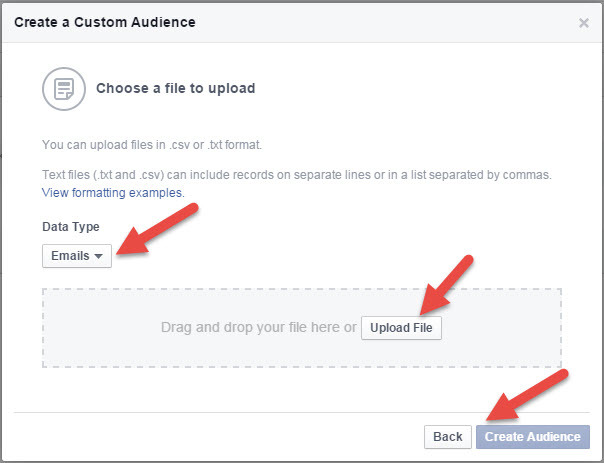 For more tips on creating a Facebook Custom Audience view their help files. 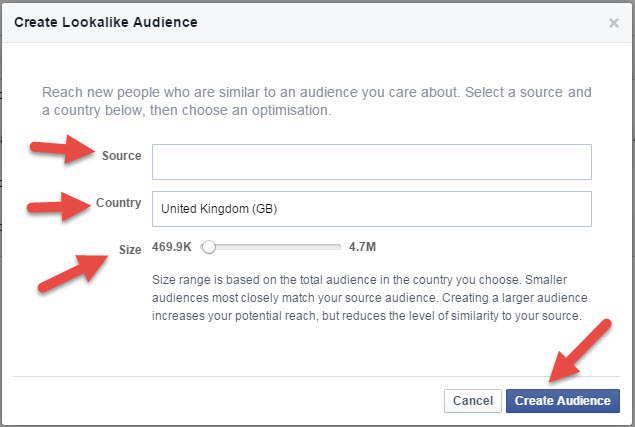 As well as targeting particular audiences with your ads, Facebook Custom Audiences allow you to exclude certain audiences from being served your ad. Like AdWords, Facebook also has a Remarketing pixel (piece of code) that you can place on each page of your website, which allows you to remarket to the users who have visited that page. The Remarketing tag can be placed on any page, which means if you place it on a page holding a particular piece of content you’d like to promote, you can retarget users who view the content with an ad related to it and drive them to a landing page to take action. For example, a digital marketing agency could retarget users who visited a page containing a whitepaper about SEO with ads about their SEO services. That ad could land users on a dedicated landing page where they are funnelled to enquire about the SEO services. If your business sells services that could add on to something someone has already bought, you could use Facebook website Custom Audiences to retarget to them and draw them back to your site to upsell them. 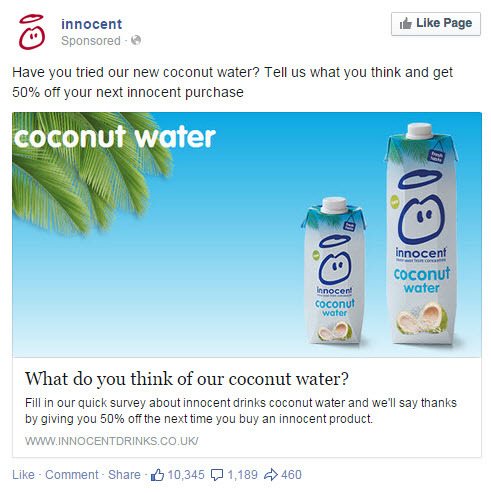 Much like AdWords’s dynamic Remarketing ads Facebook offer a relatively new ad format called Facebook Dynamic Product Ads for e-commerce websites to show Facebook carousel ads containing the products that the user viewed on their website. The main benefits of this ad format are that you can promote all your products without having to consider lots of individual ads, and because the ads feature the product the user looked at, it makes them really relevant and generates good Click Through Rates and Conversion Rates. 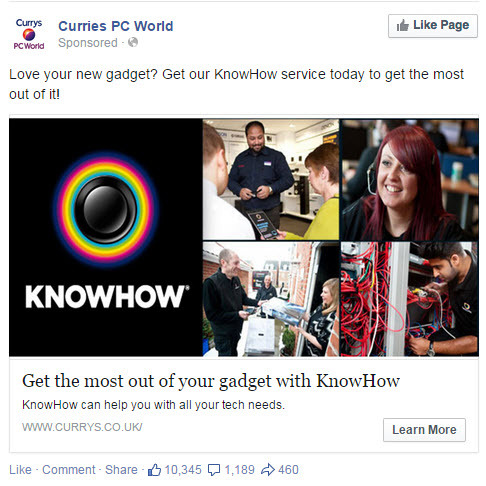 These ads work from a product feed in a similar way that AdWords Dynamic Remarketing uses the Google Merchant Centre feed, so it means your products only show when in stock. Dynamic Product Ads use the same pixel as custom website audiences but has some customization to pull in the product IDs. For information on setting these up check-out the Facebook help file. This strategy is particularly useful for lead generation websites where the user spends some time researching other companies and then deciding who to contact for a quote or more information. 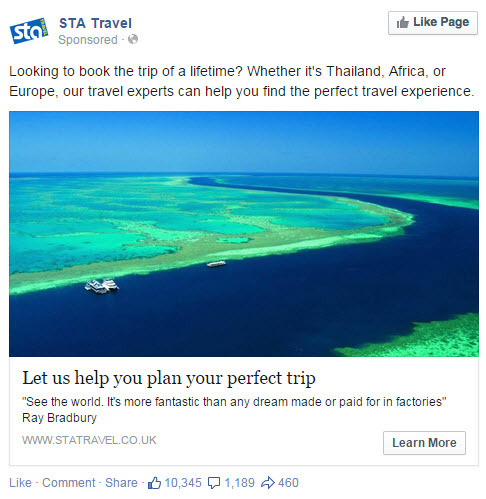 For example, STA travel could remarket to all users who visited the site but didn’t submit an enquiry or view the ‘find a store’ page. This suggests that the user hasn’t yet made a decision to contact STA in store or online and so they could be doing comparison research, which makes it a crucial time for STA to stay in the front of their mind. If you find your blog gets lots of traffic because of all the great content you have on there, but you’d like to connect it more to generating sales or enquiries related to your product or services, you could use a custom combination Facebook Remarketing strategy. For example, a cooking website could remarket to all the users who view their recipes to sell them their cookery courses. For many websites, repeat purchase and repeat visitors are very important. For example, if a supermarket knows that their average customer purchases every two weeks, they could use Custom Audiences to retarget users who haven’t visited the site within the 14 days to remind them to do their shopping and aid customer loyalty. Unfortunately, targeting is limited to reaching users of the whole site who haven’t visited in a certain amount of time, rather than being more specific for example targeting users who haven’t completed a purchase in a certain amount of time. One of the limitations of Facebook website retargeting is that the membership duration of this list has a maximum of 180 days, which is much less than the 540 days available on AdWords. This means you can’t target people a year later, for example, if they purchase at Christmas last year, you won’t be able to target them the following year. Choose how long users will remain on the list using the ‘In The Last’ box. Consider things like the strategy you’re using or how long the average path to purchase is for your business. You should also be mindful that the set-up of targeting audiences that viewed specific pages on your site is done via selecting keywords that are in your URL, rather than the exact URL itself. This means if you have the same keyword in multiple URLs you need to be mindful that all URLs with that keyword will be targeted. 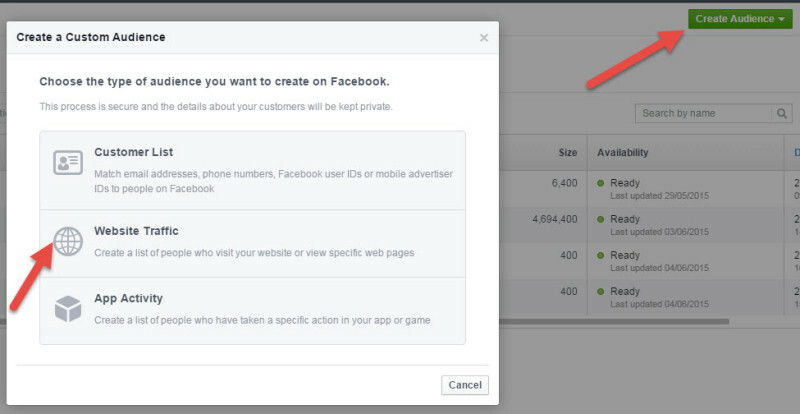 With app usage accounting for 89% of media time in mobile, you should be using Facebook Custom Audiences to target users who engage with you on your app, not just your website or mobile site. You can find instructions on how to create a Custom Audience from your app here. Remarketing lists are great, but unless you have a constant flux of new traffic going to your site you may find you get a very high frequency on your Facebook Remarketing ads, so a great way to expand your reach and to drive new traffic to your website (which also helps build new members on your website Remarketing list) is using Lookalike audiences. Using your existing Remarketing list of users who have converted on your website, you can create a list which is between 1% and 10% similar to those users. 1% being very similar, and 10% being least similar. 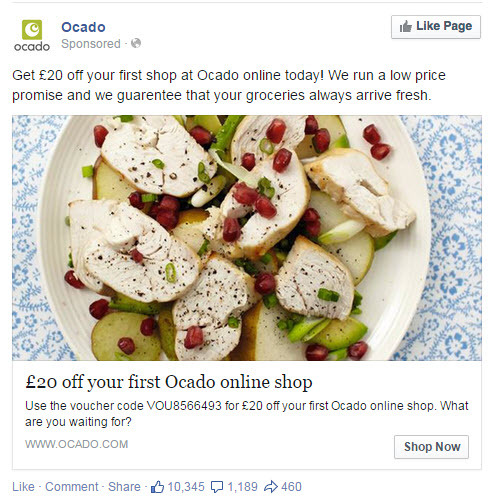 For example, Ocado could generate traffic to their site that has a reasonable likelihood of converting by using their existing Facebook website pixel Remarketing list of all users who have viewed the final checkout confirmation page, to create a lookalike audience which is 1% similar to those users. Next, click the green ‘create audience’ button in the top right-hand corner of the page, and choose the ‘lookalike audience’ option. I’d recommend getting some basic Custom Audience lists set up now so you have the pixel in place and you can use them as soon as the opportunity arises. Having these lists ready also gives you a good indicator of the reach you could achieve with them, so you can get an idea of the ad spend you could use. If you need to convince your boss or client that this targeting is useful, wowing them with the size and reach of the audience is usually a nice selling point, which is another reason to get the lists set up today! Even though Facebook Custom Audiences are still in their infancy, they are incredibly powerful. As the platform continues to grow we’ll see this targeting become even more sophisticated and it will be the advertisers that take advantage of this who ultimately get the best results with their ad spend. 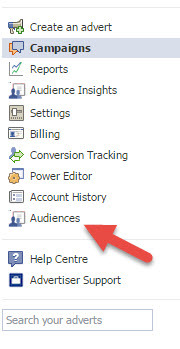 How have you used Facebook Custom Audiences? I’d love to hear your ideas so leave a comment below if you’d like to share them. I Love Custom Audiences on Facebook. I’ve even created one for my LinkedIn audience. This is precisely the kind of marketing article that sets my heart racing. Thank you for making this.